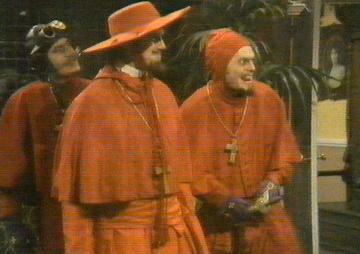 NOBODY expects the Spanish Inquisition! Our chief weapon is surprise…surprise and fear…fear and surprise…. Our two weapons are fear and surprise…and ruthless efficiency…. Our three weapons are fear, surprise, and ruthless efficiency…and an almost fanatical devotion to the Pope…. Our four…no… Amongst our weapons…. Amongst our weaponry…are such elements as fear, surprise…. I’ll come in again. Oooh, sorry I went a little Monty (not the full monty you’ll be glad to hear, but just a little monty)…and what in heaven’s name has bought this about…. Well we have just been inspected, by the CQC…. For those outside the British Empire I shall explain….The CQC stands for the Cruel Quality Critique sorry that’s the Checking for Quality Crimes, no, no, urm it’s the Care Quality Commission, that’s the one. Basically for years general practice has been allowed to doss along, minding its own business, up until the point the police identify that we’re giving morphine to all our patients. Now however the CQC has been introduced to inspect surgeries to ensure we actually know what we are doing, don’t have more maggots than patients and that all the patients are happy for reasons other than morphine addiction. The CQC first came about in hospitals a few years ago, causing uproar from staff, who pointed out that they were now spending nursing hours filling in forms to keep the CQC happy and not actually having time to keep the patients happy. It caused so many problems, nursing break downs, and time off sick with stress they thought it was a good idea to introduce to primary care too! It’s not quite the Spanish Inquisition – the element of surprises comes with a 48 hour warning. That’s about enough time to remove maggots from the surgery and remember to put your name badge on, but not enough time to fill everyone’s clinic with the nice patients who think we’re great, so on interviewing they all say nice things. I suppose it is more of a witch hunt, they have been commissioned to find problems – so find problems they must, or else they will be made extinct and have to find another irritating admin post in a sidewards management shuffle…we know how these things go. So the night before the inspection I was not stressing – I know our practice is fab. I also know that as with the witch hunter general of old – the CQC inspectors know they have to find fault otherwise they’ll be out of a job, so I had a low-grade anxious feeling. I was visualising a Men-in-Black-esq team of crack professional invading the surgery, quizzing patients, inspecting the back of the radiators for dust, ensuring that we didn’t have pillow cases that could be harbouring life threatening viruses and performing rectal swabs on any soft toys…. On the day of the inspection rather than a witch hunting crack team, there was in fact one witch, hunting. As predicted we passed with very little intervention required. Our Practice Manager has a list of intriguing jobs to do to prove we weren’t perfect and that we did in fact needed inspecting. All the Practice Manager has to do is to supply all patients with sterile balaclavas in the waiting room to ensure confidentiality. Then install soap dispensers above and below the current soap dispensers, so you can wash your hands before you touch the soap dispenser and after you’ve touch the soap dispenser. Then he needs to take the doors off the toilet so nobody has to touch the door as this may be an infection control risk. Obviously it doesn’t matter if someone sees you having a pee, as your balaclava will protect your identity. Or something like that. Thank god we passed! So for those of you with inspections yet to occur, don’t panic…. unless you are crap! Incidentally – I’ve had this blog for SEVEN years and 4 days – goooooooooooooood grief.